bookkeeping solutions. Learn more below. Our expert accounting team based here in Seattle, Washington, can help you breakdown the pros and cons of different accounting software. From there we’ll help you create a plan and implement your new accounting practices. As a certified QuickBooks ProAdvisor’s team, we can help set your company up with Quickbooks Online. We also specialize in QuickBooks cleanups and data transfers from any other accounting software. Joy Accounting Services helps your company know where you’re at and know where you’re going with comprehensive financial and reporting statements. Payroll for your small business can be time consuming and frustrating. Let our professional payroll consulting and management team take over for you. Choosing the right software and achieving the best setup are only as important as your ability to use the software. Our professional accounting software training team can help. Joy Accounting Services is here to help guide your company throughout the years. Our professional accounting software support team can help you implement, change and troubleshoot almost anything. Keeping up to date on accounting can be onerous, difficult, and challenging for most small business owners. It’s just not why you got in the game. You want to be doing what you love – running your business, helping your customers, and celebrating your victories. The reality is, however, that at best most small business owners are simply ‘getting by’ with their accounting practices, and at worst they are getting harassed by the IRS due to not paying enough attention to this aspect of the business. At Joy Accounting Services, we seek to understand your business objectives and needs. We can set you up with reports that tell the story of where your business is, but more importantly, where it needs to go. We provide a map for how to get there. This is much more than bookkeeping, it is providing foundational information which will help propel your business forward. We understand that you can’t wait around for analysis; you need real-time data to enable you to make relevant decisions. That’s where our real time information system, powered by Quickbooks Online, comes in handy! Reduced accountancy fees because it makes it easier to produce end of year accounts. 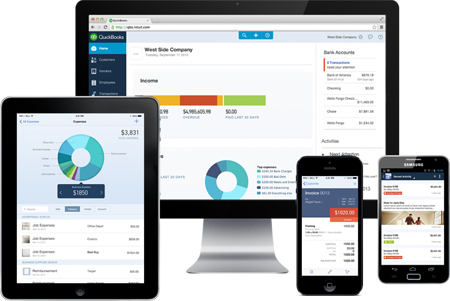 We recommend Intuit QuickBooks Online as the best accounting software for small businesses. QuickBooks Online has all the necessary accounting features for all types of small businesses, including freelancers, consultants, online merchants, store and restaurant owners, and service providers. Whether you’re just starting out or looking to expand, QuickBooks can provide you with only the basic features, or the software can be scaled and customized with advanced capabilities to fit your growing business’s needs. Contact us today to help get started with QuickBooks accounting solutions.